Are you considering partial or full dentures? Dentures are used to replace teeth for individuals that have few or no remaining teeth. 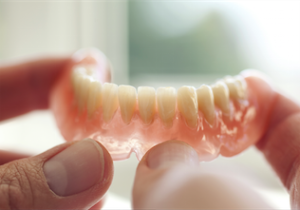 We enjoy replacing bad teeth or no teeth with dentures, but learning to wear dentures can be a challenge. We believe that a commitment to make sure that dentures fit well, and looks great, requires information, knowledge and time. Dentures and partial dentures are laboratory fabricated prosthesis which replaces the teeth which have been lost for whatever reason. A denture replaces all the teeth on the upper or lower or both while a partial denture replaces only the missing teeth on the upper or lower. Every person in need at this level is different from everyone else. There are no two denture / partial patients the same. They are different on so many levels, such as expectations, another person input, and financial ability, overall health, capability to adapt. The support and anatomy is as different in each person as their individual finger prints. This is an area of dentistry which can be one of the most emotionally rewarding aspects of my career to know that you have changed not only that person’s life but their loved ones as well in a very positive way. The following is a testimonial to Dr. Anthony Adams and his dedicated staff. Prior to my becoming a patient with Dr. Adams my dental trips were few and far between, thus when the need became so great I could no longer avoid dental services. I found myself calling Dr. Adams who had been recommended by my mother. My first visit with the doctor and staff proved to be a turning point in my dental care. Dr. Adams alleviated my fears and started to earn my trust. In the following months doctor Adams devised a plan to restore my teeth to their former glory and give me back the smile I no longer had or used. My personal plan required a formidable amount of dental work, meaning I spent a great deal of time at the office. I cannot say enough with regard to the staff, Jennifer and Deeva, who made me feel at ease with the excellent care provided and excited at the same time, above the transformation that was taking place. Of course Dr. Adams is the best dentist I have ever had in my entire life. His skills restored my smile, which you never realize how important it is until it is gone, and his compassion made the transformation possible. I now never miss my cleanings and or my checkups nor does my entire family. So if you are reading this, contemplating utilizing Dr. Adams Services, DO NOT HESITATES!! Not only will you see the difference, you will feel the change. Sincerely Cynthia C- Dr. Adams is the best dentist I have ever had in my entire life. His skills restored my smile. This letter is to express my sincere appreciation to you for a solution to a lifelong problem of extensive and expensive dental work. When we had our first consultation I was discouraged because I felt the solution for me was going to be dentures with all the problems that they pose. You offered me a new course of action called an over denture and you can eat anything with the same comfort and confidence your own teeth provided. I appreciate your wiliness to see me the same day, if some small adjustments needed to be made. Your staff has proven to be very competent and accommodating. In closing I want the thank you for your expertise and ability to provide me with this excellent solution. Sincerely, Carol J. G – Expressing my sincere appreciation to you for a solution to a lifelong problem of extensive and expensive dental work.